This is a really exciting week for me, fellow Mages, because I finally got into the Legion beta! Although I’ve done my best to gather information to share with you up to this point, and colleagues have been very helpful (thanks again to Megan O’Neill for helping me with screenshots multiple times), there’s nothing like seeing something with your own eyes. I can give you some first look impressions of what I’ve seen so far. I started out with a Fire Mage on a leveling server, but I’m going to be checking out the other specs too as time allows. Note that although I’ll be talking somewhat about Felo’melorn and questing, I’m going to try to keep this article reasonably spoiler free. There’s a teeny mention of a small NPC thing after you acquire Felo’melorn. If even the tiniest spoiler would upset you, maybe skip that section. Before you get down to the business of acquiring your artifact weapon, there’s an initial series of intro quests. What I liked about these is that they are largely presented in the form of scenarios, so there shouldn’t be the same kind of intro quest problems that have sometimes happened in previous expansions like the Alliance helicopter fiasco. Much of it is self-contained, it’s a good experience, and I enjoyed it. It was a solid introduction that felt sufficiently epic. More than that, actually, I liked that there was a sense of all of Azeroth uniting against this threat. There are small acknowledgments of some different races. Sometimes the story in Warcraft can get a little too focused on Stormwind and Humans or Orgrimmar and Orcs for me. This feels like something they’ve gotten right, this time. 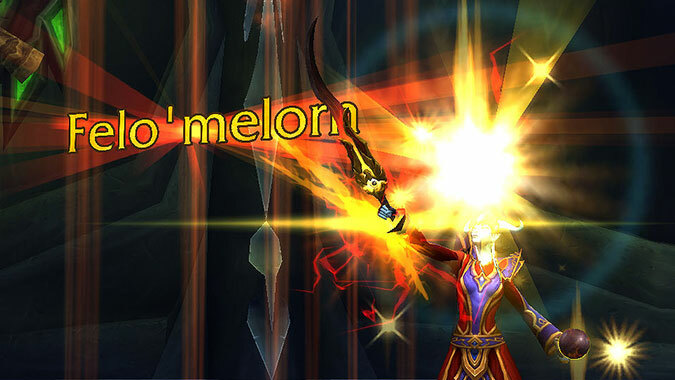 I really enjoyed the quest chain to obtain Felo’melorn. It was the perfect balance of Mage lore, characters, motivations and actual gameplay challenges. I imagine it’ll be easier for “live” Mages who are decked out in their end-game raid gear and with Nithramus, the All-Seer. For my “base game” beta Mage it definitely felt achievable but not without danger. I’ll admit to you, I did die once, mostly when I got reckless. To complete all of the challenges you’ll need to pull out some of your Fire Mage bag of tricks. It was a good quest chain, it reminded me a little bit of a Diablo III set dungeon but not as gimmicky, and also a little bit like the Dragonwrath quest chain from back in the day. There’s a definite sense that you are a very important Mage hero and so if you like that, you’re going to love this. This actually continues after you’ve acquired Felo’melorn in a way I thought was fantastic. Arriving in Dalaran, I saw a small star indicated on my mini-map. Never having seen that before, I went over to the area of Dalaran to see what was up. There’s a blood elf blacksmith in the blacksmithing shop Tanks for Everything that had dialogue for me. He saw that I was carrying Felo’melorn, which is a pretty big deal for blood elves. He explained some of the magic he could feel in the construction of Felo’melorn once I’d agreed to let him check it out for a few minutes. After I was finished talking with him, I received artifact power! This isn’t the only blood elf you’ll meet who is interested to see Felo’melorn, either. I thought this was such a great touch, it grants you artifact power so it is functionally useful, but it also really emphasizes the importance of this weapon you’ve been chosen to wield. 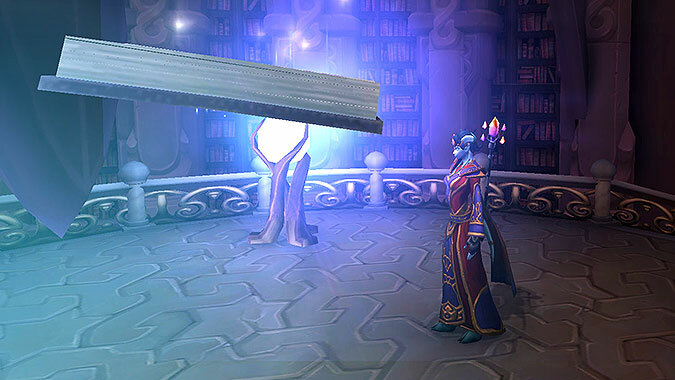 You unlock the Mage clubhouse as part of the artifact quest chain. I know you’ve all seen images of it before so I won’t go on about it too much, but experiencing it for myself was really great. Having Mages from both factions there also makes it really feel like a centre of knowledge and shared purpose. 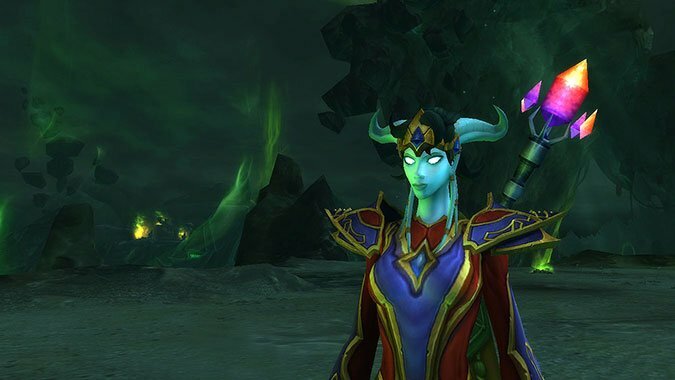 Unfortunately, seeing so many other Felo’melorns, Ebonchills and Aluneths has the opposite effect on your immersion, but it’s one of the things we all have to accept about World of Warcraft. You are the world’s most important hero – just like everybody else! Now, as for the nitty gritty of leveling. 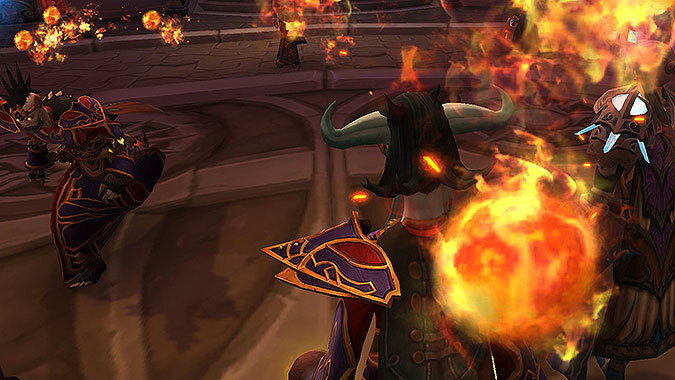 Starting out, I have to admit Fire felt a bit empty before I actually had Felo’melorn in hand. Initially I didn’t take Living Bomb, and then I did take it just to have one more button to press that wasn’t Fireball spam. Having Living Bomb helped in this regard, but it feels very different from its live version. Keeping in mind that Living Bomb has changed – it can only be applied to a single target, and it can be cast every twelve seconds. Having a twelve second cooldown just lends itself to more downtime while you’re trying to get on with the business of killing things. It does spread when it explodes, making other affected targets into Living Bombs, but cannot be spread manually in any other fashion. This isn’t specific to Fire, but I like Shimmer so far as a talent choice. Having the additional Blink available regularly is very useful. Especially with Fire’s relative vulnerability when it comes to being hit in the face, it’s nice to be able to be canny and put some distance between you and an enemy that wants to close the gap. It’s important to note that if you choose this talent, though, you lose the ability to free yourself from stuns and roots the way that Blink does, so you are definitely making a conscious decision to let that go. As I mentioned previously, my initial talent choices were focused on more passives and single target than they were massive AOE damage, probably too much so. In general once I adjusted them away from some of the passive talents (e.g. Controlled Burn, Kindling) things started to feel better. I tried out Conflagration because I realized I was still going to be casting Fireball an awful lot. I also picked up Blast Wave and Meteor. Blast Wave is nice in this current incarnation. It’s not as fiddly as the Blast Wave you might remember, because it’s a targeted ability (and if you don’t have anything targeted it just explodes around you, so be mindful of that). Meteor hasn’t changed, really. The only advantage of using it in a questing situation is that you’re the one to blame if you accidentally move your own mobs out of its impact point rather than a hapless tank. Now, of course once you do have Felo’melorn you get access to Phoenix’s Flames and I have to be honest – at the initial point when you get them, they’re a bit underwhelming. This could just be because the leveling experience is of course aimed at everyone having these awesome artifact weapons and the mobs have a lot of health, but I definitely wasn’t mowing down everything in my path. Considering that it does take some time to build up enough artifact power to actually acquire artifact traits, I’m sure this will improve as I get closer to max level. That’s something worth noting, actually — although I feel like I’ve barely scraped the surface of the leveling experience, don’t expect this to be an immediate process! I was only about 20% of the way through level 100 when I was done most of the intro quests and even having acquired Felo’melorn and started questing in Azsuna I’m still not yet level 101. There’s going to be a lot of content to make it through on the way to level 110! If you enjoyed playing Fire previously, you’re probably still going to like it although there have been a few changes. The new spell graphics look great, and all the crackling and cinders make it so that you definitely feel like the volatile Mage we all know and love. The only major concern I have is survivability, but I’ll need to see how that plays out with better gear and increased investment into Felo’melorn’s artifact traits. In the meantime, it’s nothing impossible to handle, just something to keep an eye on as beta testing progresses and I won’t have a complete picture until I’ve spent sufficient time playing the other specs.